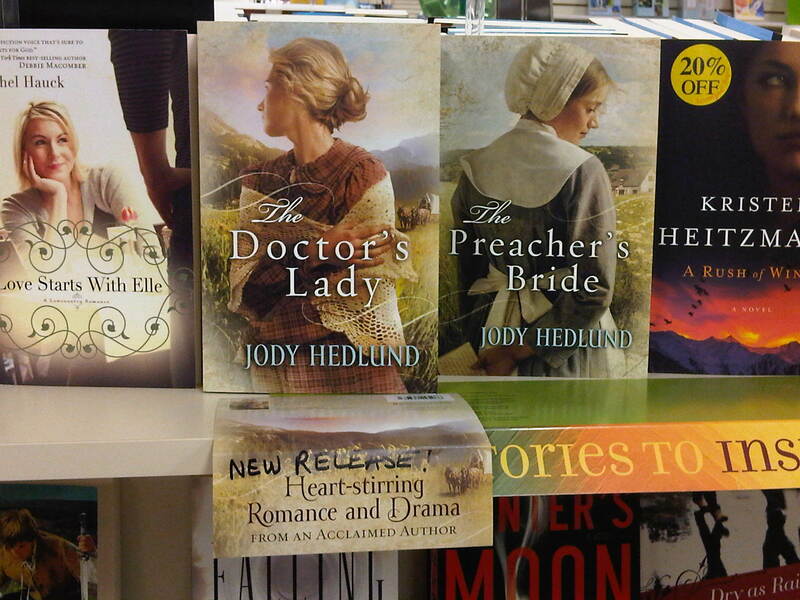 Author, Jody Hedlund: How Can Authors Get Their Books Into Bookstores? How Can Authors Get Their Books Into Bookstores? Many authors dream of the day when they can walk into a bookstore and see their masterpiece displayed on a shelf. They dream of picking up the book, smelling the ink on the pages, kissing it, and crying tears of joy. However, the sad reality is that many authors browse the store only to find that their book isn’t where it’s suppose to be. They cross their fingers and hope the store has already sold out or given it a better spot because it’s so popular. But the reality is that the bookstore has never carried the book and doesn’t have any plans to. After the initial dejection, the author can’t keep from wondering this aloud: Why do some books make it into stores while others don’t? And wondering this privately: Why are all those other poorly written books sitting on the shelf and not my Pulitzer-Prize winning novel? As bookstores close and shelf space shrinks, obviously stores won’t have enough room to hold all the books being published. So how can authors get their books into the limited space? Who determines what books make it in? And what (if anything) can authors do to carve out a spot on a shelf? I took my questions directly to Bill Shady, National Accounts Manager for Baker Publishing Group. (My publisher, Bethany House, is a division of Baker.) Bill leads sales efforts to key CBA accounts such as Family Christian Bookstores and LifeWay. Previously, he also sold books to stores like Barnes & Noble, Amazon, Borders, and a plethora of other accounts. With his many years of experience in getting Baker books (including mine!) onto shelves, he graciously answered my questions. During our phone conversation, I quickly concluded that the process of publishers selling their titles to bookstores is much more complicated than most authors realize. Before ordering any books from a publisher, bookstores have to open accounts with the publishing house. The process of setting up an account requires a lot of paperwork and often the logistics can be overwhelming. (This will vary from publisher to publisher—some may be difficult and others might be much easier.) That means bookstores are more likely to buy from publishers with whom they’ve already established accounts. Often it’s not worth the work and trouble for bookstores to set up accounts with smaller or newer presses. Once the bookstore has an account with a publisher, they work with the sales representative like Bill to obtain the books they put onto shelves. When Bill meets with the store’s buyer, he brings catalogs, pictures, and a spreadsheet which lists authors’ titles for the past 2-3 years along with sales figures. The bookstore buyer looks at the spreadsheets and makes decisions accordingly. Previous sales play a critical role in which books the retailer buys. Debut authors are harder to sell. Obviously new authors don’t have past sales records for stores to look at. So stores pay more attention to the genre, the catalog information regarding the book, and the marketing value a publisher is assigning to the debut author. Some managers will be more savvy about the business than others. If they’re busy or don’t understand the process, they may say they can’t do anything, that decisions are made on a corporate level. And to some extent that’s true. But, on the other hand, if the bookstore already has an established account with the publisher, the manager still might be able to order the book. The hard reality is that much of the control of getting a book into a store is out of an individual author’s hands. And even harsher is the reality that unless the publisher is already established in the store, authors have very little chance of getting the book in. Lest I end this post on a depressing note, Bill held out a ray of hope for all authors no matter their publisher. He indicated that an author can check if Ingram carries their title. Ingram is one of the largest distributors of books in the US. Every chain and bookstore uses Ingram to some degree. If Ingram carries the book, then a store could order it from Ingram (versus the publisher). There you have it—the ins and outs of how books make it onto the shelves in brick and mortar stores. Many thanks to Bill Shady for taking the time to share his wealth of knowledge with us! So, raise your hand if you’ve ever dreamed about walking into a bookstore and seeing your book on a shelf (here’s my dream post!). Do you still have the dream? Or as the times have changed, has your dream evolved into something else? I don't know why this post makes me nervous....or maybe a combination of nervous and giddy. I have no idea. I just hope that my book makes it into bookstores! This is so interesting. I love learning more about the book industry works. Thanks for the information, Jody. A little depressing, but very informative nonetheless. I appreciate your putting this post together; I really had no idea what went on behind the scenes. Also, I loved your 'dream post.' I wasn't blogging or reading many writing blogs back then, so it's neat to read something from that point in your publishing journey. I have a huge confession: I love my new Kindle Fire. Love it! How does that relate to your question...yes, I still have the dream, but I'm open to how it will come to fruition. My hand is raised! I learn so much from you Jody! Good morning everyone! Glad that the post is educational! I learned a lot too from talking with Bill. Lynda, I'm sorry to hear about your experience with some of the local stores in your area. From what I understood from Bill, there is so much out of the individual author's hands. Most of the decisions on what a bookstore carries happens when the store's buyer meets with the publisher's sales rep. Which just shows how important the publisher's sales department is! I suppose sneaking a box of them into the store and shelving them yourself isn't really an option? Great post, and definitely something to keep as a reference. Thanks! This is an incredibly useful post on something we rarely see discussed. I think you could add that getting friends/family to request your book is another way to help get it on shelves... ;o) And yep, having worked as the manager of the textbook department at LSU for a few years, I know all about Ingram. Great tips. I do dream of seeing my book on the shelves one day. Alas, will I beat the e-revolution? We'll see! Thanks, Jody! I've had this dream since I was about 12 and it's still as strong as ever. I'm fortunate enough that my book will be distributed through Ingram. The tricky part is going to be getting my book into non-Irish bookstores! Jody, Great post. I learned some of this the hard way by butting my head against the stone wall represented by certain bookstore managers. One of the low points of an author's life: looking for your book and finding that the store doesn't stock it. A high point in an author's life: finding your book on an end cap in a book store. A shameful point in an author's life: finding your book on a shelf and "facing" it--turning it cover out so it's more obvious. Thanks for the insider info, Jody! As with many things in life, we just don't have as much control over this as we'd like. Thanks for the tips! This is great information! Thanks Jody! It makes so much sense with more and more books being published, that there's just not shelf space for them all in brick and mortar stores. Sobering, and humbling to be sure! Its comforting to know that there are ways an author can help get their books onto shelves and makes me thankful for all the Indy booksellers who often have more freedom to work with new and small press authors. Thanks so much for being willing to share the behind-the-scenes view of publishing with us. I have a dream...that one day...I will see my book in stores ( both hands raised high!). Lol. Great post! Thanks, Jody. My book won't be in Barnes and Noble (except for those stores near me). A debut middle grade literary historical isn't exactly a hot seller at our country's biggest chain. And that's okay. May B. will find her place in the indies (and online). Thanks for sharing this info. It seems that it takes a village to sell a debut book in a bookstore...or, more presisely, lots of publisher support. Thank you for sharing these fabulous advices on the process! My hand is up, and the dream is still alive! As always, great information. It's good to get another take on the business and what's going on with hard-cover books. Thanks for passing along the knowledge. Some bookstores (such as Barnes and Noble, and Family Christian Stores) have submission guidelines right on their websites for authors who wish for them to carry their books. For me, Barnes and Noble carries my book on their website, but to get it into the stores it would either have to have a high sales rate, or I would have to deliver a submission packet to each individual store in the area. If they chose to put it on their shelves and it did well, then it would be put on shelves nation wide. Heather, Thanks for sharing your further insights and what's worked for you! Appreciate it! If anyone would explain how an author can find out if Ingram is distributing his/her book, I'd be most grateful! Karen, From what I understand Ingram carries most traditionally published books. But I think your publisher could check for you. Or the bookstore in question could look it up for you too. It only matters to me if my book is carried in a local store after I first release it and publicize it. Most people are shopping online these days, and a non-famous author's book can easily get lost in a real book store, esp one as big as B&N unless you're publicizing the heck out of it. Out it goes into the discount bin if it doesn't sell - or worse, it gets returned. Local indies are much more amenable to your book and may allow you a book event. Jody, Thank you for taking your time to post an informative blog. I am going to check out Ingram immediately. It would be interesting to know how many books are being ordered online compared to how many books are being purchased in a store. This is very good blog about shoes. and i get very good information for there. thanks buddy.